CROSS PLANES: Rick Remender is a bloody genius! I have run a comic book store for the last 13 years and I have trouble keeping up with all of the reboots, especially from Marvel Comics. 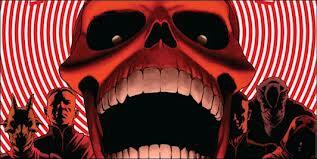 Marvel Now appeared to me as a pretty normal reaction to DC's New 52. But I've been generally surprised at the quality of most of the titles. I wasn't expecting much out of Uncanny Avengers (Brian Bendis's run has not been my favorite), but when I saw Rick Remender writing it, I decided to give it a look. Boy I'm glad I did. #1 was good, but #2 just knocked my socks off! In a way that Stan and Jack must have back in the day. Seriously, it's a very modern book, but it seems to understand all of those cool, over-the-top ideas that "Stan the Man" and "King Kirby" put off for so many years. Check out Uncanny Avengers, it's possibly the coolest presentation I've seen of the Red Skull in years (and yeah, I'm a big fan of Brubaker's Cap).